I’m dancing a happy dance! Pixie’s lady from the 3 Ladies RR is done! Well, at least my part, lol. And she’s only a year late going home! 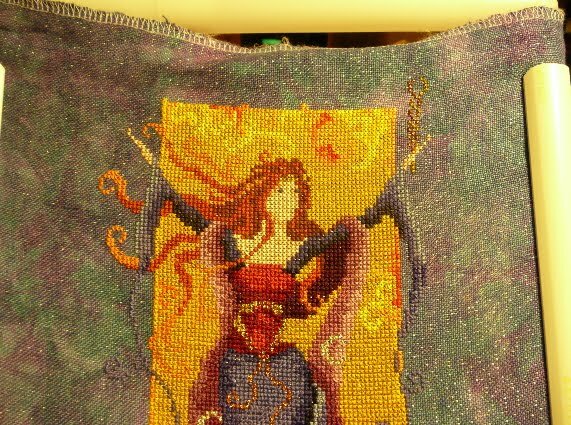 As you can see from the pic, the project was started too high on the fabric – there are at least 18 rows left. But that’s up to Pixie to figure out how to work it – or if she even wants to. I’ve met my commitment and it’s out of my WIP bag and will be on it’s way home this weekend – with some goodies for her, because she’s been so patient! I went ahead and finished the wand (which went above the top of my section) so other than some long stitch stars, she has no need to stitch with the metallics – just one color of backstitch along the skin edges and however she decides to do the top. Great RR finish Andrea! That fabric looks gorgeous. Yay!! It looks great Andrea!